I’m a list-maker. I make lists for things to do, dates to remember, errands to run, groceries to buy, parties to plan…I really seem to have a list for everything! If you like lists too, then you’ll like this handy baby shower checklist with tips on what to do while planning a fabulous shower. There are a few questions you need to ask before you start planning a baby shower. Talk to the mommy-to-be and find out what exactly she wants. It’s a day about celebrating her and the baby on the way so you’ll want to make sure that you focus your energy on the areas that are important to her. Hosting: Will you be the sole host of the baby shower or is there someone else that the mommy-to-be would like to involve? Date: Does the mommy-to-be want to have the baby shower before or after the baby is born. It’s important that you ask the mommy-to-be this question because some women have a strong preference in when the shower is held. Guests: You don’t need to plan out the entire guest list now but you should check her preferences on a girls-only shower or a co-ed shower. If there will be males at the baby shower, there may be a few elements that you’ll plan differently. Theme: Does the mommy-to-be have a theme for the baby’s room? If so, you may want to have a similar theme to the baby shower. Gender: Does the mommy-to-be know the gender of the baby? If so, you’ll want to incorporate this into the party (as long as she’s made the gender announcement to family & friends already). Register: Will the mommy-to-be set up a gift registry? This doesn’t necessarily have to go on the party invites but the information could be shared by word of mouth. There are many things to think of and to prepare for when planning a baby shower. This baby shower checklist is intended to help you organize and plan for the special day. You can also click here for the free printable Baby Shower Checklist. Decide on a Theme. As mentioned earlier, you may want to incorporate the theme of the baby’s nursery. If the mommy-to-be has already announced the gender of the baby, you can work this into the theme as well. Deciding on a theme early is important as many other items on this baby shower checklist will reflect the theme. Guest Count. Ask the mommy-to-be (and her mother) for an estimate on the guest count for the party. This is important to know before choosing a location and ordering supplies. Choose a Date. Check with the mommy-to-be to hear her preference. She may want to have the baby shower a couple of months before the baby is due so that she has time to sort and organize after the shower. Choose a Time. If there will be toddlers invited to the party, keep in mind that most youngsters take their naps in the early afternoon. Set Your Budget: It is important to set the budget early on because you’re bound to find many cute accents to the party that you’re going to want to purchase. It’s important to set your budget and track your spending to make sure you are staying on track. Secure a Location. Do you plan on hosting the baby shower in your home? You’ll need to know a rough guest count estimate to make a proper decision for the party location. Put a Deposit on Rentals. If you need to rent tables or chairs for the event, you’ll want to start pricing these out now and putting a deposit down on the rental. Will these be delivered? If not, think about who will be responsible for picking these up and returning them. 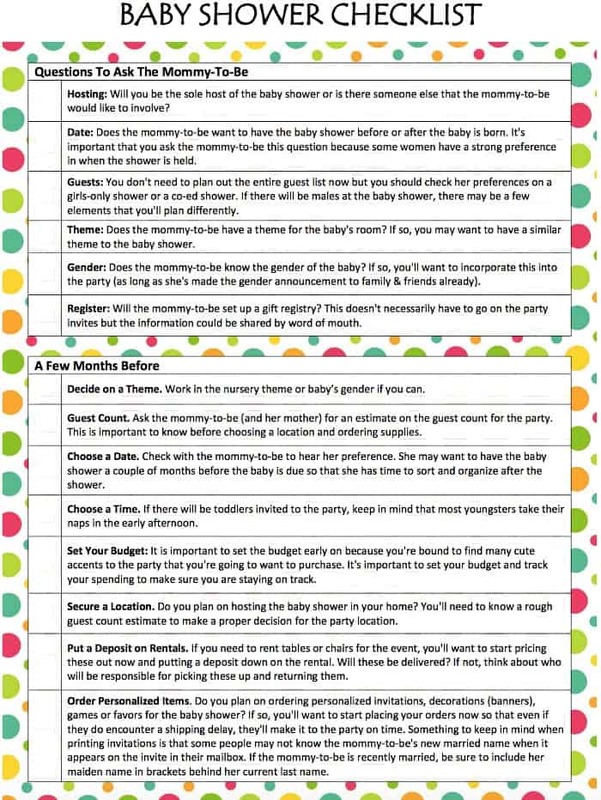 Don’t be afraid to ask for help on specifics in this baby shower checklist. Order Personalized Items. Do you plan on ordering personalized invitations, decorations (banners), games or favors for the baby shower? If so, you’ll want to start placing your orders now so that even if they do encounter a shipping delay, they’ll make it to the party on time. Something to keep in mind when printing invitations is that some people may not know the mommy-to-be’s new married name when it appears on the invite in their mailbox. If the mommy-to-be is recently married, be sure to include her maiden name in brackets behind her current last name. Purchase Decorations. This could include ordering helium balloons or flowers and purchasing items such as tableware (plates, utensils, cups and napkins), centerpieces, wall decor, signs welcoming guests to the party and hanging decorations. For ordered items that must be picked up on the day of the party, start thinking about who you’ll assign to do this. Finalize the Menu. What appetizers and desserts will you be serving at the shower? Finalize your menu for the party and make your grocery list. Also think about how you will serve the food. Do you have the proper serving trays, punch bowl, etc.? Plan Your Games. What games will you play at the party? Visit our Baby Shower page for lots of free printable game ideas. Buy Prizes. After you decide how many games you’ll be playing, you’ll want to purchase a prize to be awarded to each winner. Your local dollar store is a great place to find inexpensive prizes. Order the Cake. If you plan on ordering a cake or desserts for the event, now is a good time to do so. Make sure you confirm the pickup time. Make notes on the Baby Shower Checklist for who will be responsible to pick up the cake. Confirm. Confirm any rentals or special orders you have made. Follow up on any ordered items that have not yet arrived. Confirm Guest Count. Follow up with guests who have not yet RSVP’d. Clean your Home. If the baby shower will be held at your home, now is a good time to start cleaning. Confirm Your Helpers. If you have items to pick up on the day of or day before the shower, ask someone you trust to help you run errands by picking up table & chair rentals, cake, flowers, etc. It’s also a great idea to ask someone to help you on the day of the shower so that they can run out for any last minute items while you are setting up. Make notes on your baby shower checklist of other people’s responsibilities. Arrange for Help Transporting Gifts. Make sure the mommy-to-be will have help bringing all of her gifts home and getting them into her home. Grocery Shopping. Complete your grocery shopping now so that you have plenty of time for cooking and baking the day before. Remember to also think of what you will serve the guests to drink. Wrapping. To minimize the tasks you have to do on the day before the shower, you can wrap your gifts and the game prizes now. Prepare the Food. Prepare as much of the food on the day before the shower as you can. You’ll have a lot to do on the day of the shower so it would be a great help if all of the cooking & baking was already complete. Get Your Camera Ready. Make sure you have extra batteries for your camera and space on your media card. Set Up Tables & Chairs. If you have to order tables and chairs, it’s a good thing to ask for them a day before the shower so you can get set up early. Prepare Games. Set out the party games and the required supplies (pens, spoons, blindfold, etc.). Gift Area. Set up an area where guests can leave their gifts. You may want to do this close to the area where the mommy-to-be will be sitting. Set Up Area for Mommy-To-Be. Set up a comfortable area for the mommy-to-be to sit. Extra pillows would be appreciated! Decorate Party Area. Your wall decor, table centerpieces and all other decor can be set up the night before. Don’t forget scissors and tape. Set Up a Private Area. If there will be nursing mothers at the party, be sure to set up a private area where they can nurse and change their babies. Set Out Favors. Assign a table by the door for the favors. This way you are less likely to forget to give the guests their favors when they are leaving the party. Garbage Area. Set up a garbage area with garbage bags. This includes a bag around the gift area for all of the wrapping paper. Set Out Food. Set out the food and desserts. Remember to include plates, cups, utensils, napkins and serving spoons. Buy Ice. Buy ice for the punch bowl. Pick Ups. If you have any items to pick up on the day of, make sure your helpers do that for you. This could include the cake, flowers and balloons. Welcome Guests. Welcome the guests to your home and have an area for coats and shoes. If your children are old enough, this would be a great way to involve them in the party. Write Down Gifts. Help the mommy-to-be remember what gifts she has received and from who. Either write this information on each of the cards or in a notebook. This will be a huge help later when she’s writing her thank you cards. Have Fun! This is a special day for the mommy-to-be and everyone that is celebrating with her. Enjoy the day and don’t worry about any little things that don’t go according to plan. Click here for the free printable Baby Shower Checklist. We’re always adding new party tips and ideas! Never miss an update by following us on Facebook, Twitter, Pinterest and Instagram. Thank you for the great checklist. I have two nieces on the way that I have to have baby showers for so this is perfect. What a great list! This would be perfect for so many other parties too. Excellent! Thank you for your kind words.